A box full of these arrived in the mail yesterday!! It feels like forever since I received an email from Martingale Press asking if I'd like to contribute to a publication of sewing patterns. (I did, of course! Once I got over the shock of being asked.) I'm so happy with the way this book turned out. 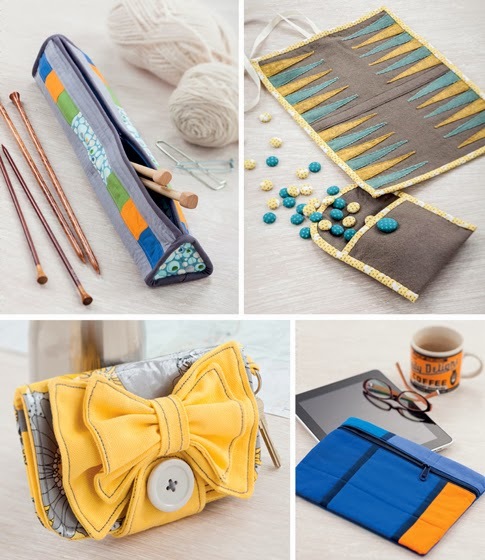 Sew Gifts! is a charming book with clear instructions and illustrations, and a great variety of really lovely gifts to sew. And it's just in time for the holidays, too! Photo courtesy of Martingale Press. Here's my contribution to the book, the Bird on a Branch pillow, photographed beautifully by Martingale/That Patchwork Place. (I still can't quite believe it's in a book!) And here are just a few of my favorite projects by other designers. Photos courtesy of Martingale Press. You can see photos of all the projects and read more about the book on Martingale's Stitch This! blog. I know many of you are much more organized than me, but I also have to guess that I'm not the only sewer with grand plans to create handmade gifts for friends and family each holiday season... only to get started way too late to finish them all. Let's rectify that with a Sew Gifts! giveaway, so you can get started on your gift making before it's too late! 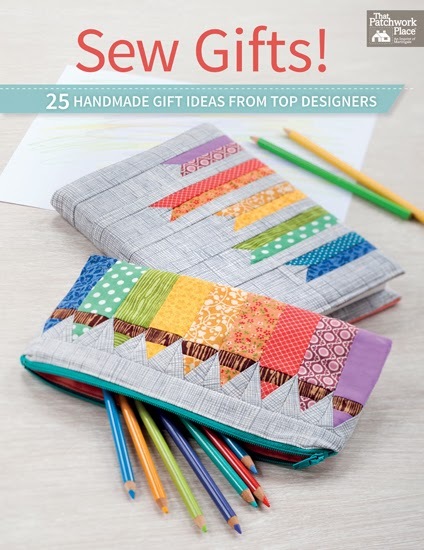 Thanks to Martingale, I'm giving away one digital eBook of Sew Gifts!. To win, simply leave a comment on this post below. If you're not sure what to write, please share your own gift making plans for the holiday season or any upcoming special occasion. For another chance to win, let me know in a second comment that you follow me -- either on facebook, through Bloglovin', RSS feed, or some other way. The giveaway is open until 6 pm EST next Wednesday, October 23, when I will choose a winner at random. Good luck!! Or purchase a copy of Sew Gifts! at your local bookstore, in the Martingale shop or through Amazon. 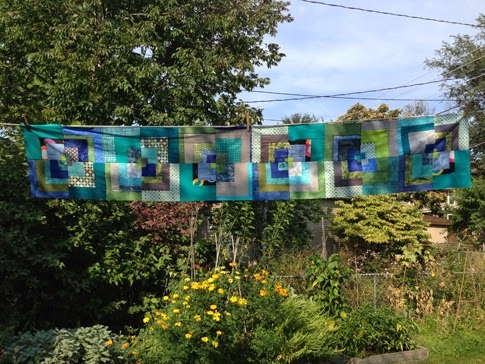 Last Spring I joined the Chicago Modern Quilt Guild in order to meet like-minded creative people and to be inspired. As it turns out... it worked! I've met some great people who are doing similar, and also different, things than myself. 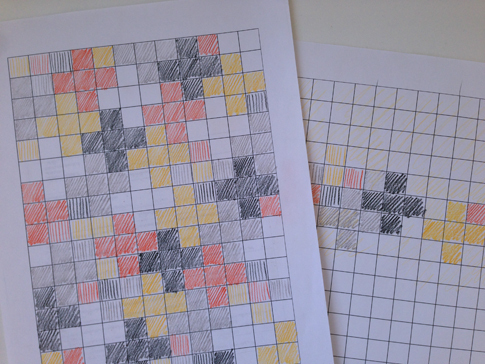 And now I'm actually working on a quilt (in fact, I'm working on two at the moment)!! 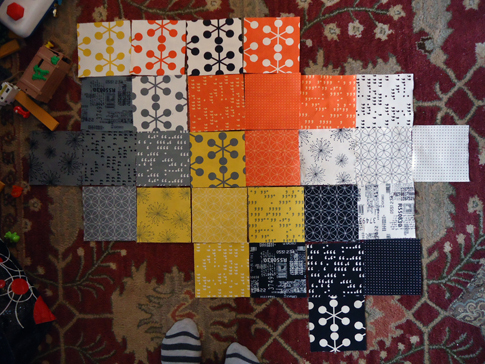 Pictured here is about one quarter of a charity quilt that I'm collaborating on with three other CMQG members. It's made up of scrappy log cabin blocks cut into quarters and then randomly re-pieced -- very similar to the Scrapper's Delight pattern from Sunday Morning Quilts. I'm also finally putting the binding on my quilted Mondrian table runner which has been a work-in-progress for an embarrassing long time! Since I volunteered to put the binding on our charity quilt and... ahem... haven't actually bound a quilt before... you know, where I have to turn corners and stuff... I decided I should practice! I machine stitched the binding to the front of the quilt and am enjoying the somewhat meditative process of hand-stitching it to the back. I'll post photos soon of that finished quilt. In the meantime, I'm plotting a bit of selfish sewing this week. This seriously could not be happening at a better time. I've been pretty overwhelmed with a new, big volunteer job I've taken on at my kids' school this year. 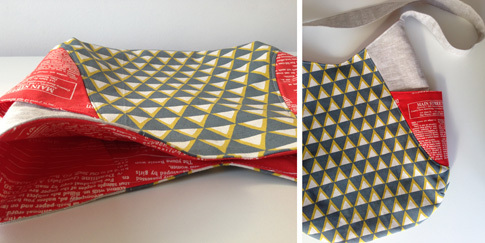 I've been feeling absolutely sewing-deprived... and, now, the perfect excuse to sew (for myself, no less!) has come along. 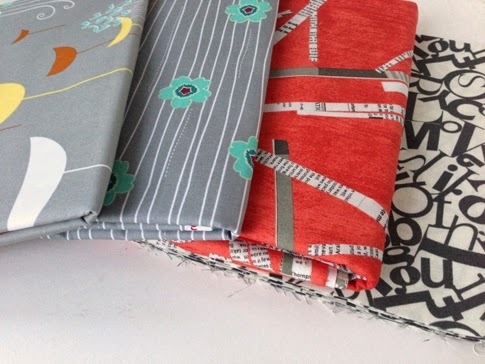 Here's a peek at some of the fabrics I recently splurged on in anticipation of sewing for myself. Yes, sewing... for me. I won't feel guilty. Nope, not at all. Okay, maybe a little. But I'll get over it when I put on my brand new sewn-by-me duds! Last spring, when I was scheduling our summer and discussing options with the kids for camps and other things, my oldest told me that he didn't want to do too much this summer. I think he specifically said, "I just want to relax." Well, relax we did. Spent time with cousins, and more time with friends. 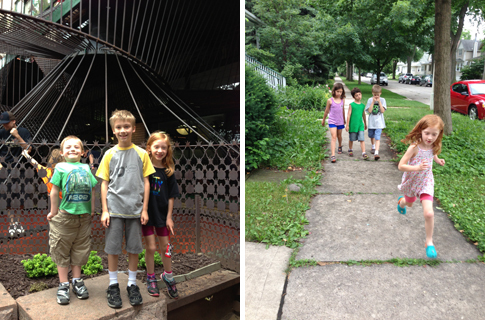 We had a fun-filled, but also a lazy summer. Just the way it should be, I suppose. Or at least that's what I told myself when I was feeling guilty for not updating the blog ALL summer. These years of being able to really spend time with my kids are limited; I'm grateful for this time just being together. I'm also ready for school to start again on Monday; for us all to be back on a schedule and to be able to accomplish my own tasks. But, man, what a lovely, lazy summer! A bag... and a book! 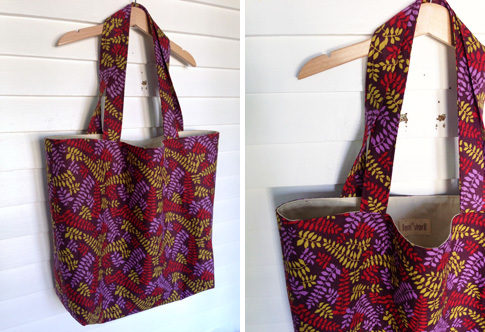 I finally got around to making another 241 tote, this time for myself... and it just makes me so very happy. 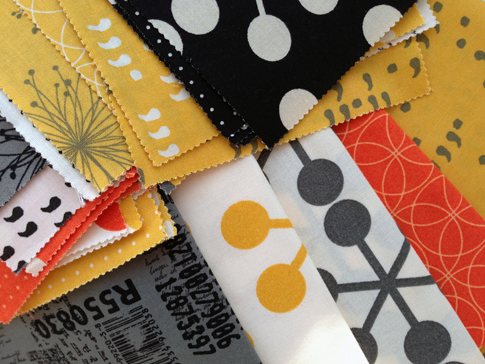 Really, though, how could these fabrics not make a person cheerful?! 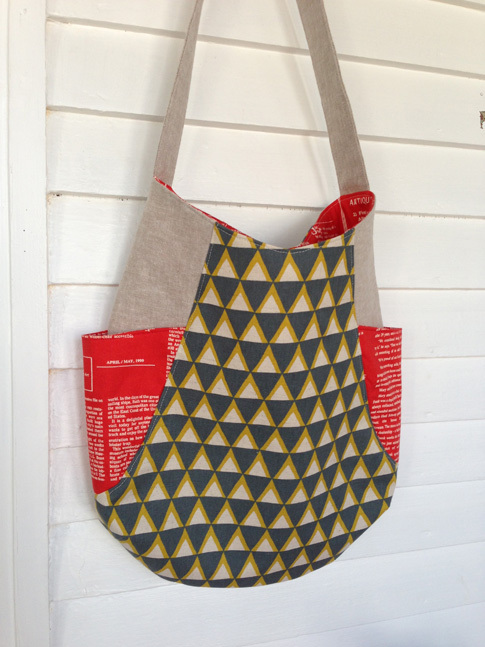 You can see my first 241 tote here. It's my new everyday bag for summer. I made the handle extra long so I can wear it across my body, and I added interfacing to the handle, so it will hold up well to everyday use. Other than that, I just followed the lovely pattern instructions. Fabrics are Echino insect in Natural by Etsuko Furuya cotton/linen, Bella Mini Dot in Sunspray by Lotta Jansdotter, and, of course, a bit of Robert Kaufman yarn dyed linen/cotton (this time in Black). And (here's the "book" part), I'm so excited to finally share this news! 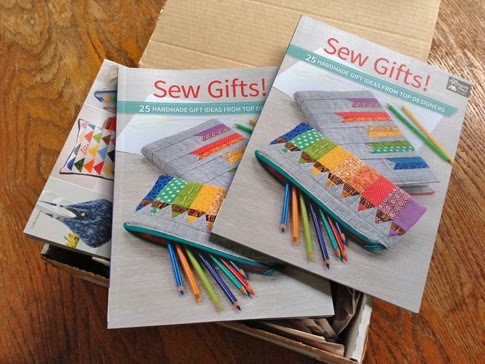 I'm a contributing author to a book called Sew Gifts! Yes, an actual book, folks! It will be released this October by Martingale Press / This Patchwork Place. 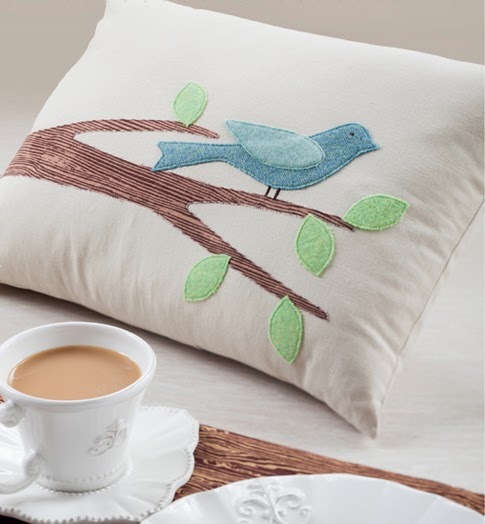 I discovered the Martingale wholesale catalog in my mailbox recently with this preview of the book, including a photo of my bird-on-a-branch pillow project. I haven't seen the actual flip-through-the pages, bound book yet, but I was able to review the proofs of my project pages and was super happy with how they turned out. Once I have an actual book in my hands (can't wait! ), I can promise there will be a giveaway... or two... or more! Catching up... plus a roly-poly winner! My kids had their last day of school on Friday, and all the craziness that goes along with the end of the school year during the preceding week(s). Included in that craziness were a couple of parties to celebrate construction beginning on a brand new green schoolyard to replace the massive blacktop "parking lot" that functioned as a play area at our school for so long. We are very excited about this!! And I'm happy to now officially be on Summer Break... but I'm also waiting for that first "What can I do?" -- the equivalent in our house of "I'm bored!" I'm trying to prepare with stacks of regular books, audio books, workbooks, and lots of crafty and outdoor activities. And I still haven't even started to sort through the massive stack of school work that came home last week. Oh well. All in good time. We've left that all behind for almost a week anyway, and have traveled to Michigan to visit my parents and my sister's family, including my new baby niece, who is just the loveliest, sweetest little thing. I managed to fit in a little bit of sewing in the last week of school, but not much. I stitched up this big tote bag for my daughter's Kindergarten teacher, then the class room parents filled it with summery and beachy-type things for an end of the year thank you gift. 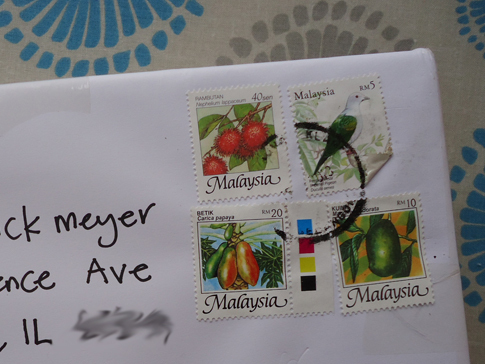 Finally, in case you're wondering who the lucky winner of the roly poly pattern giveaway was... it was Angie, who said. "my fav side is the grey with the tiny asterisk." Congrats to Angie!! 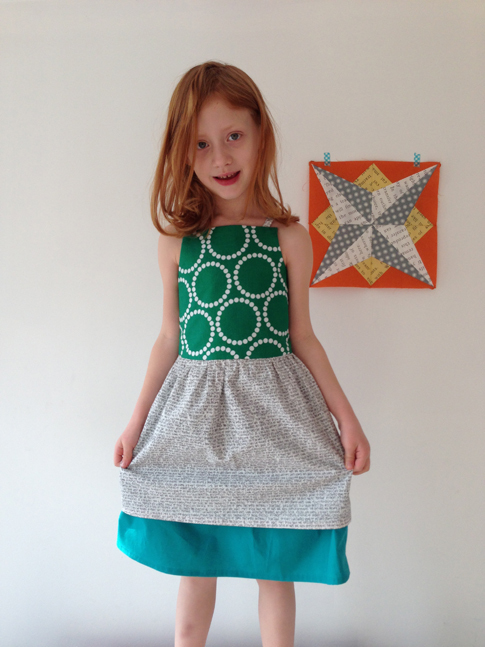 Rachael from Imagine Gnats will be contacting her shortly with the pattern link. And thanks so much to everyone who commented and visited during the roly-poly blog tour! It was so much fun to participate and to follow along and see all the amazing roly-poly creations. 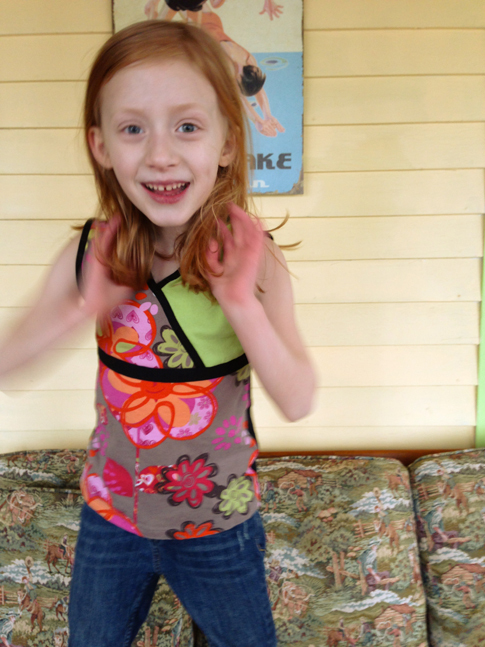 If you missed any, check out Rachael's roly-poly-along wrap-up to see them all. Welcome to my stop on the Roly-poly-along Blog Tour! 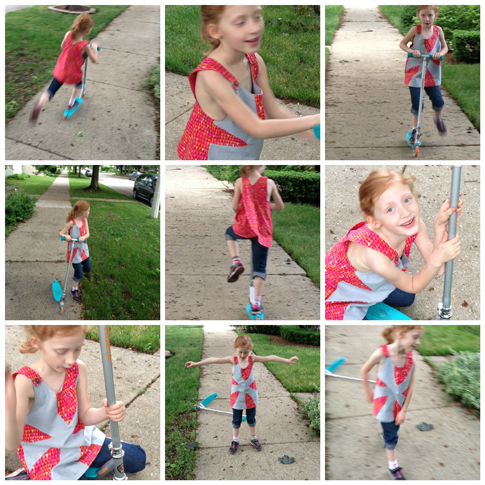 If you're not already familiar with it, the roly-poly is a pinafore tunic pattern designed by the lovely, talented, and genuinely witty Rachael Gander of Imagine Gnats. I started following Rachael's blog shortly before I met her in person last October and have to admit that I was a little intimidated to meet her. I needn't have been, though. She is warm, down-to-earth and perfectly friendly. 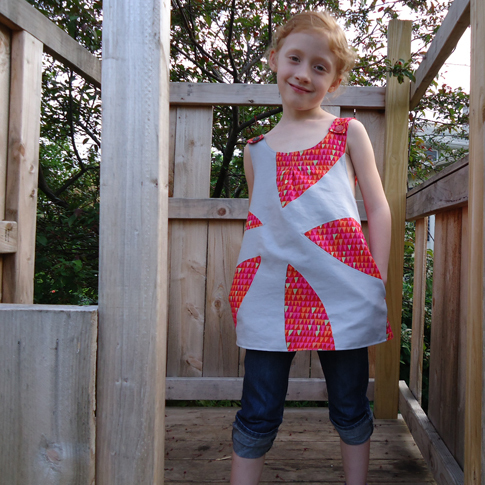 This is her first ever sewing pattern for a garment, and I am more than happy to help her promote it. It really is a fabulous pattern. 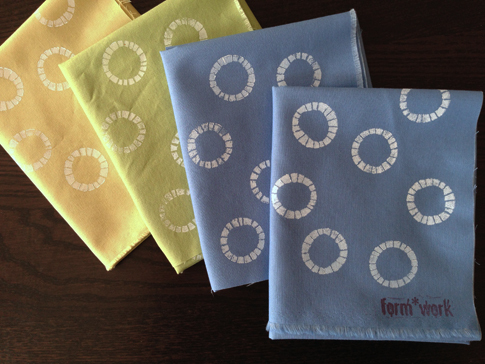 Don't miss the roly-poly pattern giveaway at the end of this post! I decided on an asterisk roly-poly for my second take on the pattern (my first version was done when I tested the pattern for Rachael). I'm a little obsessed with asterisks, although I really like most typographical symbols (or glyphs); and I'm always happy to be able to use a semicolon in my writing. Did you notice that, back there, how I slipped in a semicolon in the sentence about semicolons?! Yes, I know I'm a nerd. Anyway... the roly-poly. The pattern is reversible, which is awesome for two reasons at least: a) There are no visible seams or hems to worry about. b) You can simply turn it the other way around if it gets dirty -- perfect for dealing with ice cream drips and other causalities of summer. 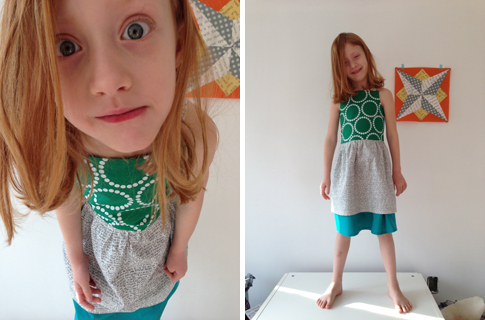 I used Essex linen in gray for the giant wonky asterisk on the outside front of the pinafore and a cotton print (Tent in rose by Brandon Mably for Rowan) for the negative space. 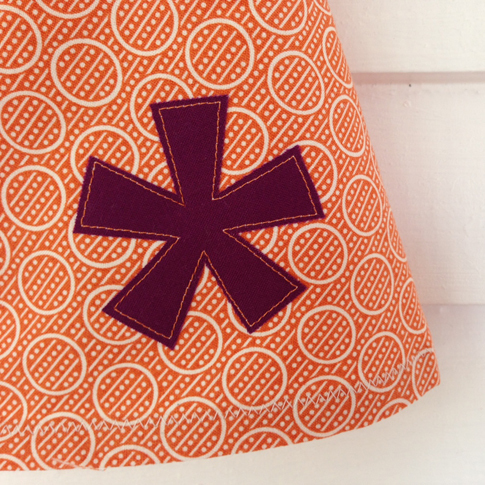 On the reverse side, I used the Essex linen again with a simple tiny little asterisk applique in the print fabric. For the back of both sides, I used the same cotton print. Don't you just love the criss-cross in the back? And the cute little pleat in the front? 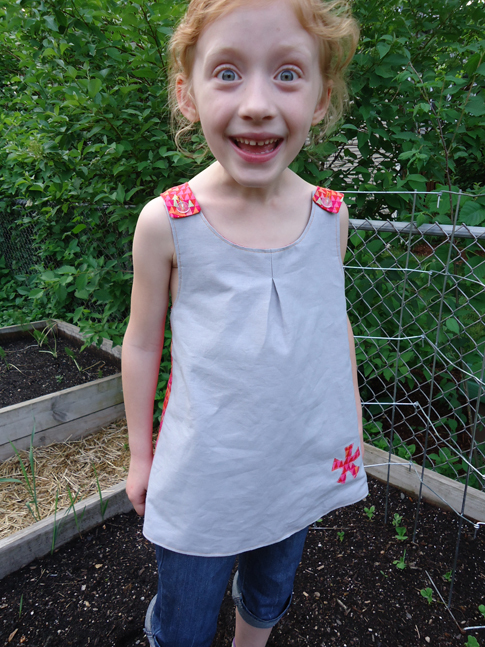 Plus, you can make the pinafore with or without pockets -- I chose to add pockets to the front side, but not the reverse. These are the perfect little details that make this pattern unique. And, although I could have constructed the big asterisk as a huge applique, I chose instead to piece it... partly because I was frugally trying to conserve fabric... but also, why not challenge myself with piecing curves and points when I had never done it before and it could easily end in an epic fail?! 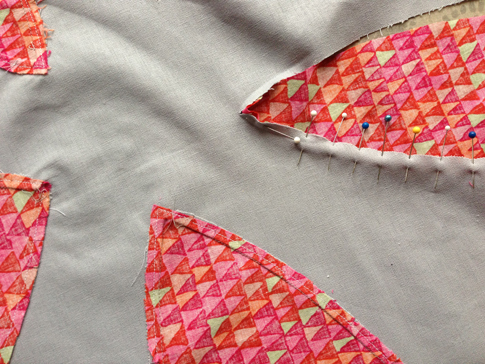 Somehow, with a little seam ripping, lots and lots and lots of pins (! ), much pressing with the iron, and shear luck, I managed to make it work. Whew! At the end of our photo shoot, my daughter took the roly-poly for a "roll" (sorry!) on her scooter. 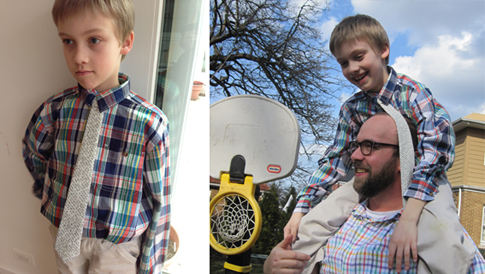 It worked well -- I think the photos speak for themselves! 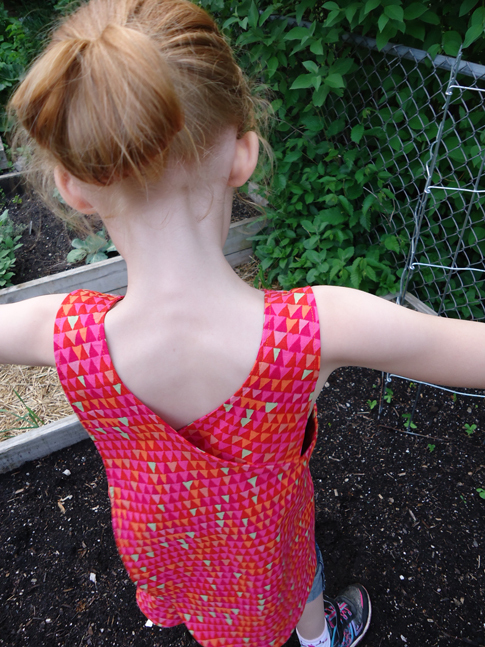 If you'd like to make your own version of the roly-poly, you can purchase the pattern here. 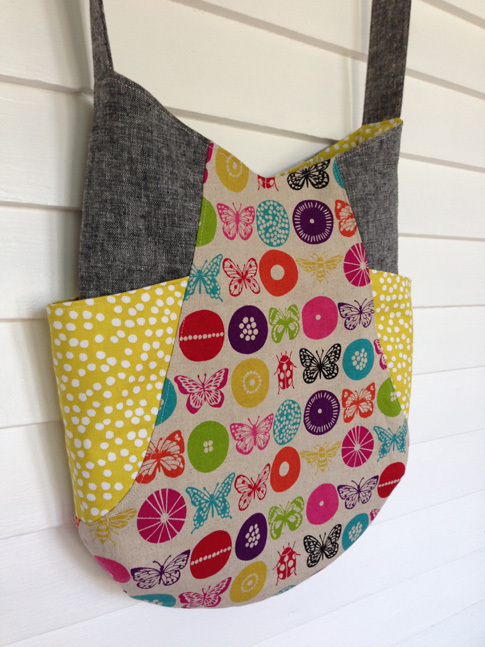 Or, even better, Rachael has allowed me to give one free pattern away here! 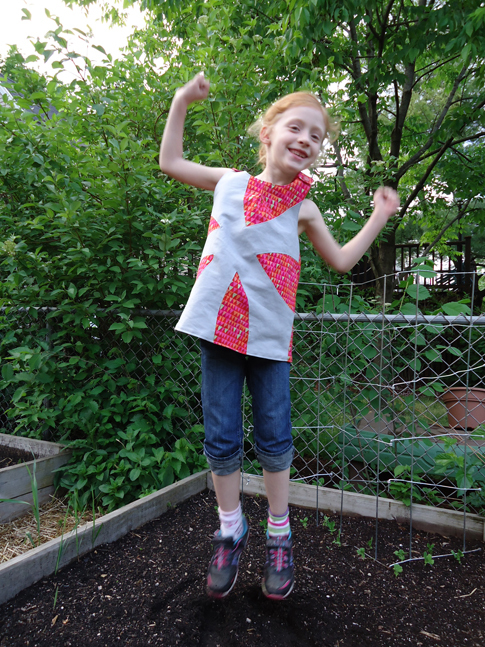 To win a copy of the roly-poly pinafore tunic pattern, simply leave a comment below before 6pm EST on Thursday, May 30. Please make sure your email is included in your comment, especially if it's not connected to your blogger profile. I've been busy, busy, busy following the steps above, but wanted to pop in here for just a moment. 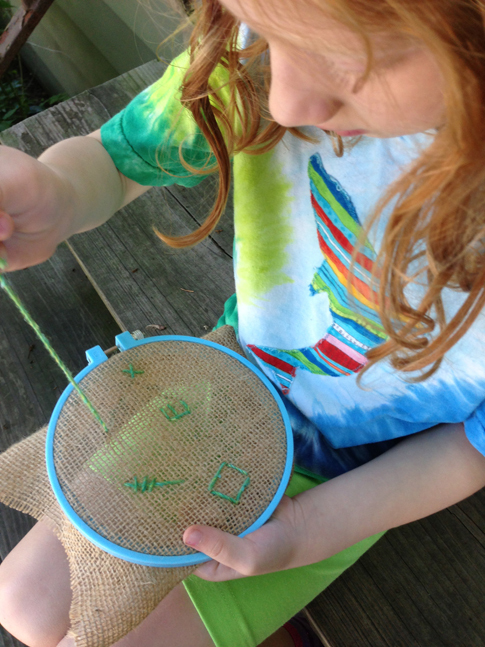 I'm stitching up as much as possible for an art fair that I'm participating in this weekend. And crossing my fingers for lovely weather (the forecast says possible rain) and lots of sales (pretty please?). 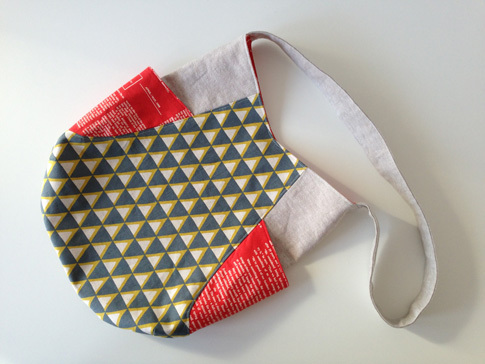 This shoulder bag is one of the things I've been making. (Forgive the cluttered background and bad lighting -- I don't have time to stage a proper photo right now!!) 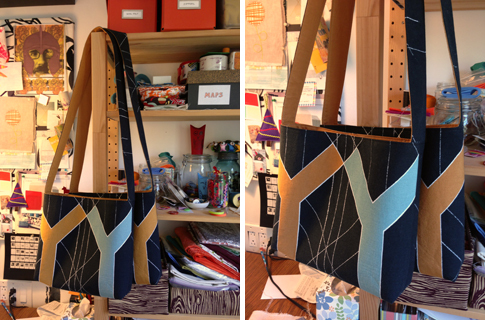 I designed the bag around this amazing architecturally graphic fabric I found at IKEA recently. It's called Bjornloka Figur. Cool, huh? It was screaming out to me, "I want to be a bag!!" Don't you see it?! The colored "Y"s on one side, and the white "Y" on the other? Plus the fabric has just enough of the black field in the middle to cut the shoulder straps from. 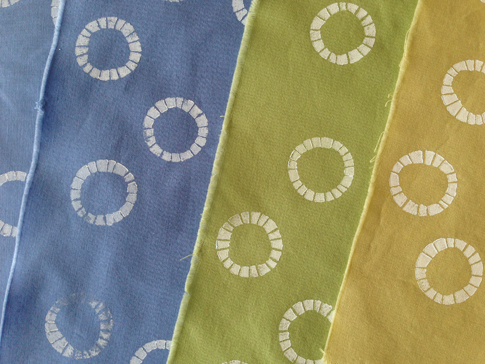 I managed to find solids fabrics from my local Joann's to match the mustard and blue for lining the bags and straps. 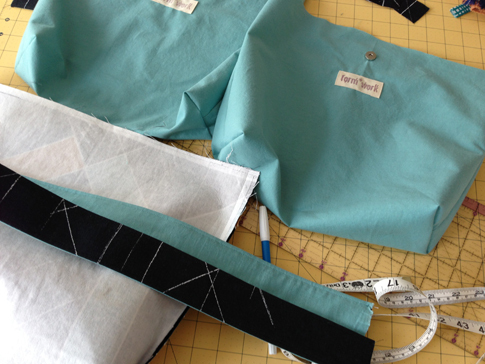 Here are some bags with the blue lining on my cutting table (aka dining room table). 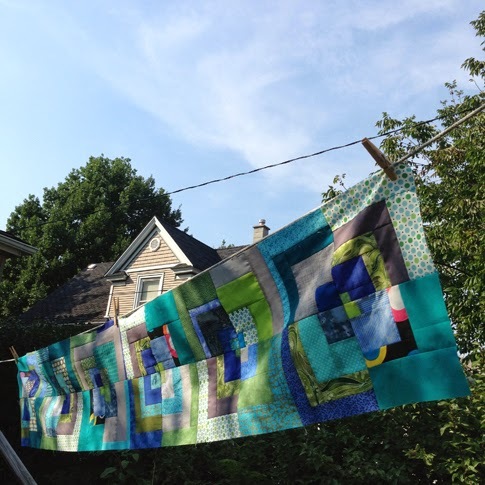 I'm fortunate to have my sewing machine in our sunny back room and so have been enjoying the sun and warm breezes of this beautiful almost-summer while I work. Speaking of my sewing desk, I'd better get back to the process of pressing, cutting, sewing, etc. before I run out of time, but I wanted to share this last image, because I love it for so many reasons. This was taken last weekend. 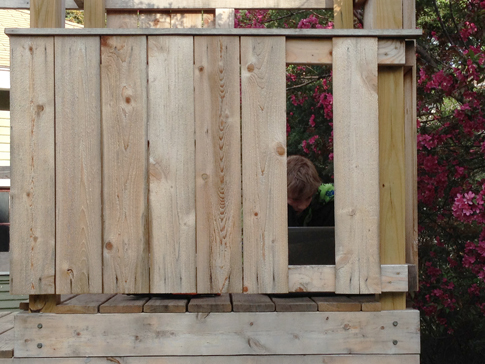 My 9 year old son is in our backyard fort with the laptop, working on a research project for school. I like the view of him, concentrating, through the "window" of the missing board. It's a cool-ish, but sunny, spring day, and our Prairiefire Crabapple is in full bloom. 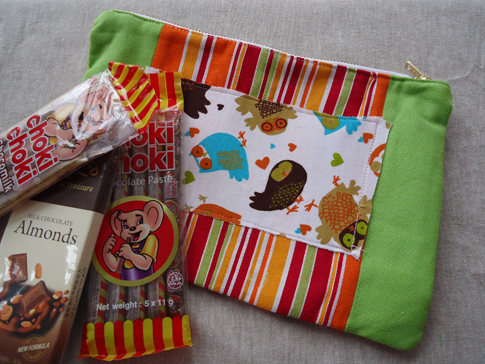 Thank you so much to all of you who read and commented on my giveaway post, as part of Sew, Mama, Sew's Giveaway Day. I loved having so many new visitors to my blog, and am also flattered that many of you decided to become new followers. 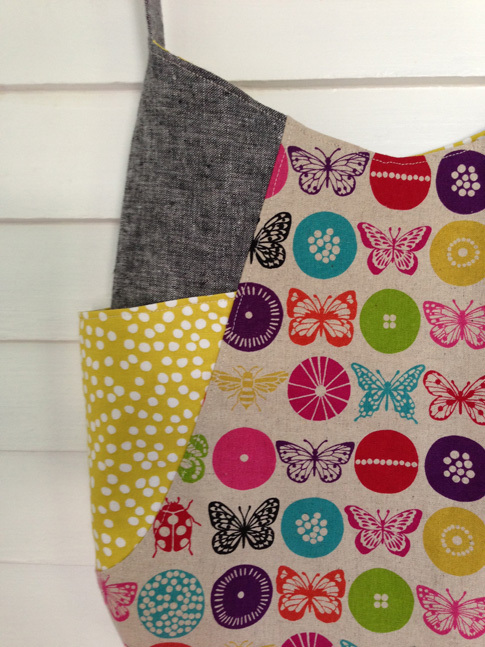 I hope you'll enjoy following along with me and my sewing and design adventures! 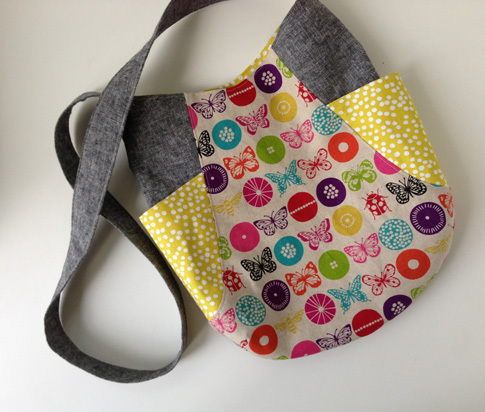 By way of a back-to-basics actual drawing out of a bag... the lucky winner of the two patterns from Such Designs and the Handmade Home book by Amanda Soule is... SIMPLESEW, comment #72. Congratulations!! 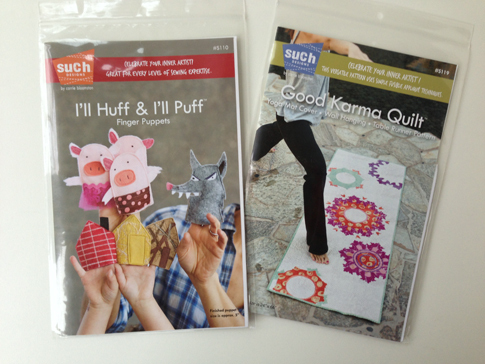 I've emailed you for your address, and will be sending the book and patterns to you shortly! And to all you moms out there, happy Mother's Day! I've had time to garden and sew today, and received some wonderful handmade gifts from my kids, so a lovely day for me so far! My new baby niece is scheduled to arrive in this world tomorrow!! 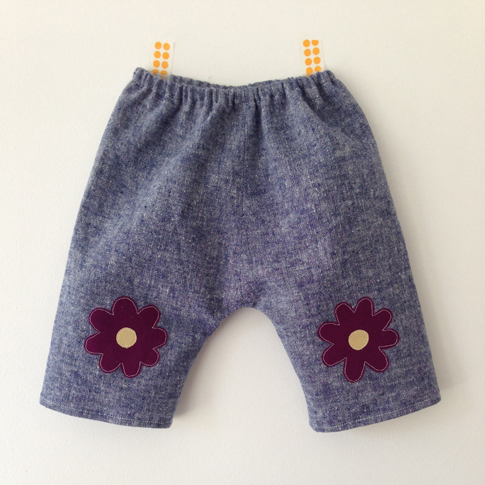 I'm so excited to have a teeny tiny baby in the family again for many reasons, but top among them is the excuse to sew adorable little clothes. Of course I'm also completely excited for my sister's expanding family and all that other awesome stuff, including the idea of getting to know a brand new person, and smelling the sweet baby smell on the top of her little head. 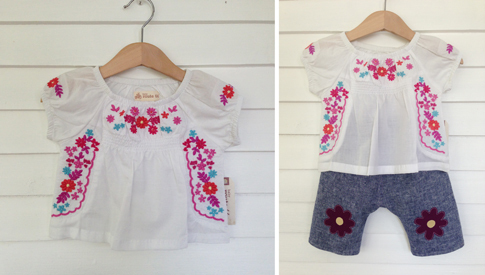 But, well, sewing tiny clothes is pretty fun, too, right?! My daughter and I found this cute infant-sized embroidered and smocked top on sale, but we couldn't find any bottoms to go with it. So I made these little bitty blue jeans. Okay, they're not really technically jeans. I used denim-colored linen/cotton (not actual denim) and I didn't add pockets or any type of "jean" detailing. They kind of look like jeans, though, because of the color and texture, so that's what I'm calling them. I designed the appliqued knee patches to go with the embroidery motif of the top, but I also wanted it to be simple and graphic, 'cause that's kind of my sewing style. Hopefully the knee patches are where her actual knees will be -- hard to tell without her here to try them on! Pattern: Basic newborn pant pattern and tutorial from Made by Rae. And I made this dress. 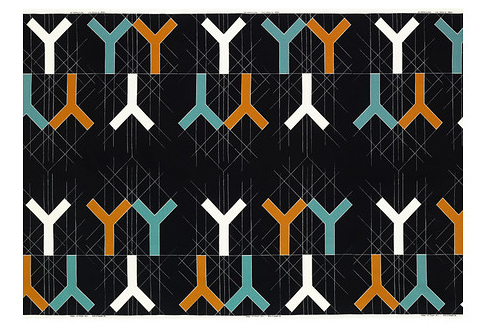 I had been toying with different fabrics from my stash for the dress, then I found this orange print from Denyse Schmidt's DS Quilts collection at Joann's. I like the retro feel and the soft orange color of the print. It just blows me away that there will soon be this tiny, fragile and amazing person who will (hopefully) be able to fit into this dress. (I can't quite seem to remember when my kids where that small anymore!) It has an applique of an asterisk because I like that symbol... and it's part of my business name... and, well, I couldn't really think of anything else except a bird or a butterfly, and those just didn't seem quite right to me. 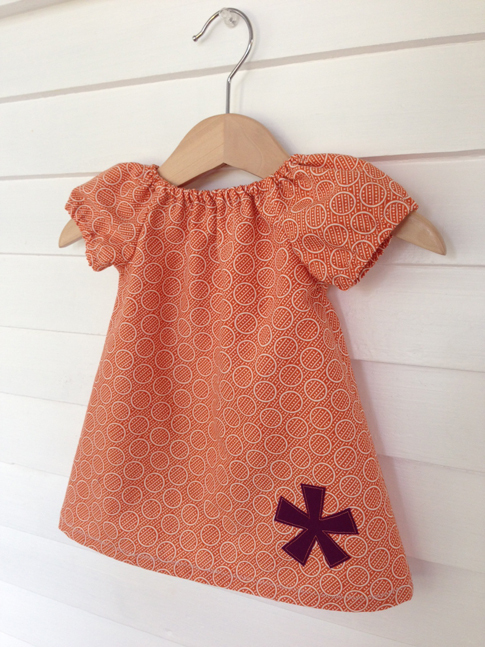 Pattern: Infant peasant dress pattern and tutorial from Sew Much Ado. I'll be sending these off later this week. Welcome to the world, little girl! I can't wait to meet you. It's that day (week, really) again! Today and all week long, you'll find links to many, many amazing giveaways on the Sew, Mama, Sew! blog. You may want to grab a cup of coffee and spend a bit of time checking out all the links. If you're lucky, you'll find a few great new blogs to follow. Plus you might win something awesome! Details on how to enter this giveaway are at the bottom of the post. 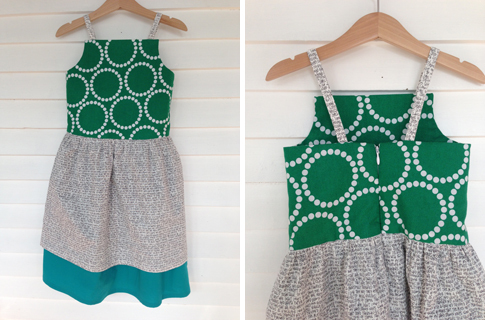 I'm giving away these two great patterns by Such Designs. The three little pigs finger puppets pattern includes instructions for a carrying bag to hold the puppets and keep things organized. 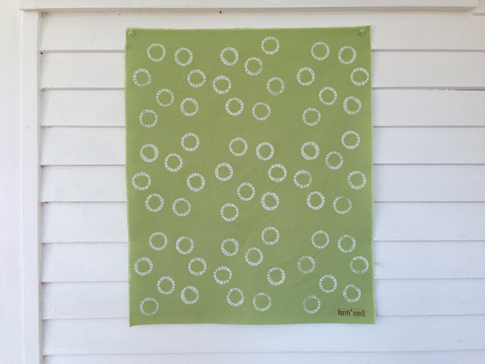 The Good Karma quilt can be used as a yoga mat cover, wall hanging, or table runner. 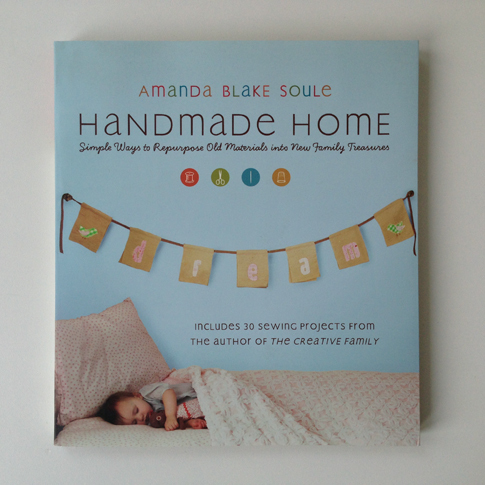 I'm also including this lovely book, Handmade Home, by Amanda Blake Soule of SouleMama. It's full of sewing projects (more than 30 in all) that celebrate family. 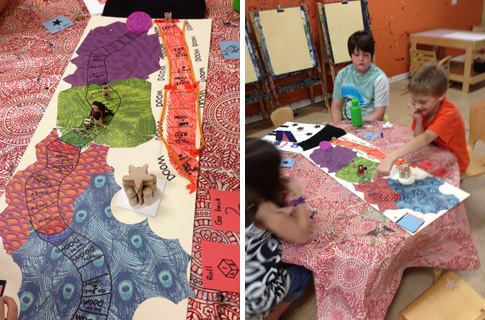 All of the projects can be made using repurposed materials, and many incorporate children's artwork. 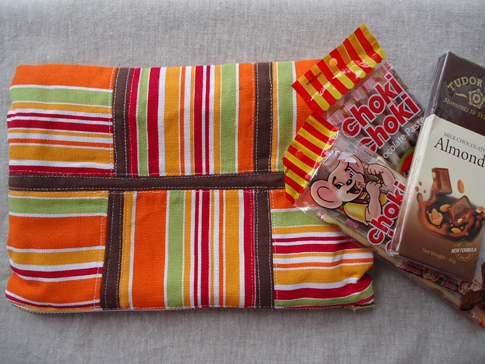 One winner will receive all three items: both patterns and the book. Simply leave a comment below for a chance to win. For an extra chance, Follow my blog with Bloglovin or some other way, and let me know that you're following me with a second comment. The giveaway ends Friday, May 10 at 5 pm EST. I'll use a completely random (but hands on) method to chose the winner -- this time I'm planning to put every comment in a hat and one of my children will draw a name. Simple, but effective... and a bit more satisfying than using Random.org. For my daughter, who loves bright colors and patterns, although she recently claimed her favorite color is black. This top incorporates both!! I found a brightly colored t-shirt at Goodwill, then two solid t-shirts (the green and black) to match. The new cross-over style top is made entirely from the original three tees. At $2.99 per shirt, the total cost was about $9.00. Not bad, right?! I had an idea in my head of what I wanted the top to look like and, using a t-shirt with a similar silhouette, I made a pattern and figured out the details as I went along. Luckily, knit fabric is pretty forgiving! 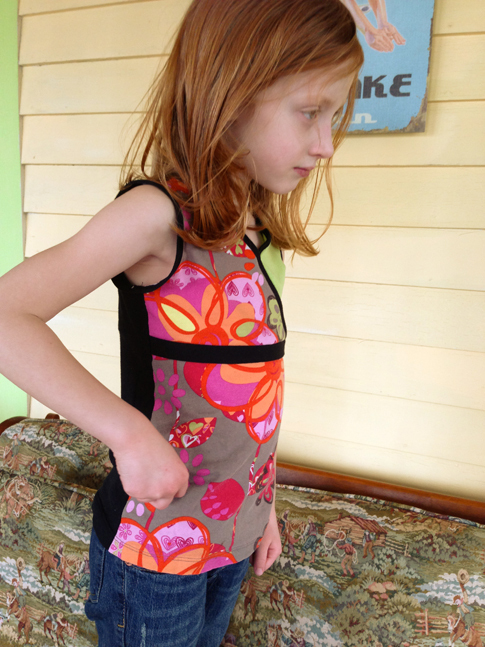 I read a bit about sewing on a knit binding, including this tutorial, then cut strips from the black t-shirt to bind the neckline and arms. The horizontal black band is simply a folded strip of fabric sewn into the seam between the bodice and bottom part of the shirt. And I cut the original shirts carefully so as to re-use the bottom hems, since I knew my stitches wouldn't look quite as neat and tidy as the original ones.